I have discovered a useful 3D graphing add in for Excel. A trial version is available here. In order to use it you have to install it so that it becomes a plug-in for Excel. Once this is done you need to import the data from the WSPR database into Excel then sort it. Then convert the Bearing and Distance information to X - Y coordinates within the spreadsheet. The S/N value is plotted on the Z axis. Different colour spots are used for each antenna. I've also added some circular distance rings, and a feeble attempt at overlaying a great circle map (wrong perspective) so that you can at least see roughly where the spots came from. Within Excel you can rotate the plot in all three directions, but obviously this is not possible once it has been exported as a 2d jpeg image. See the attached image which gives a rough idea of what can be achieved. 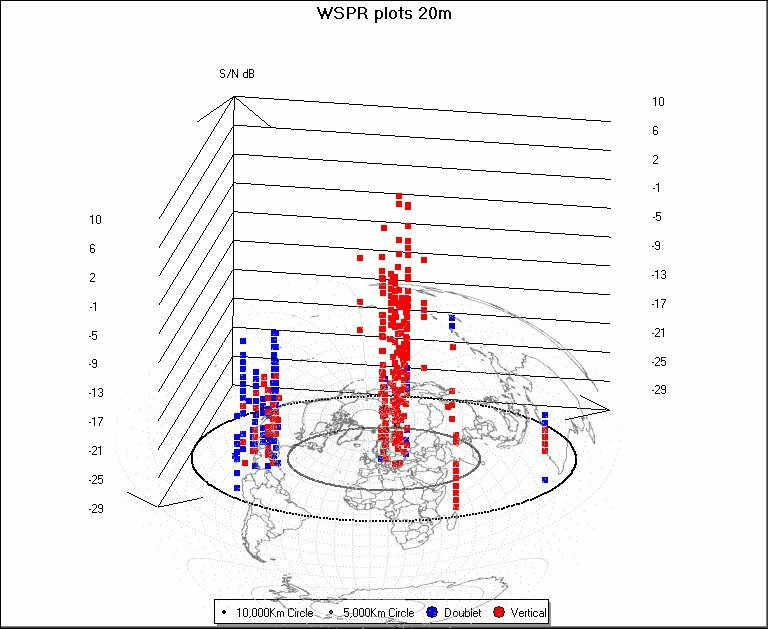 I think it's a very powerful visualisation aid, which I hope will encourage others to further analyise WSPR data.